On Friday, La Raza President and CEO Janet Murguia demanded that President Barack Obama give executive amnesty and work permits to as many as eight million illegal immigrants after reports surfaced that Senate Democrats are urging Obama not to unilaterally change the country’s immigration laws before the midterm elections. “For us, we want him to exercise the full authority that he has to provide relief for these individuals and also the opportunity to be able to leverage economic revenues and therefore provide some work permits for these individuals,” she said. Murguia also called on Obama to “more fervently exercise prosecutorial discretion” on deportations and enforcement so that illegal immigrant workers like “landscapers” are not targeted. 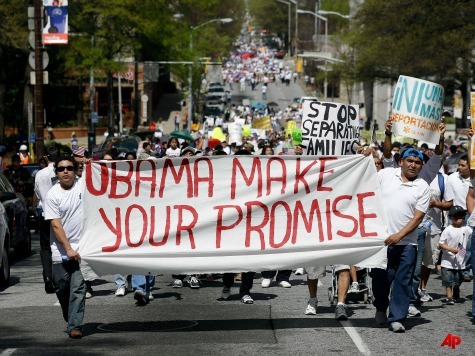 The Congressional Hispanic Caucus gave Obama a wish list of executive actions earlier this year and asked him to give temporary amnesty to every illegal immigrant (nearly 11 million) who would have qualified for amnesty under the Senate’s amnesty bill. Murguia noted that Obama has “a lot of different opportunities for him to act within the law” and has been reviewing different proposals.